Will unmanned trams appear in Moscow? First tram with a system of intellectual assistance to the driver will be tested in Moscow. It depends on the test results whether there will be responsive to obstacles and controlling the speed of trams on the Moscow roads. Russian developer of unmanned systems Cognitive Technologies and manufacturer of vehicles "PC Transport systems" developed the first in Russia tram with driver assistance system. The tram is made on the basis of the "Vityaz-M" model. 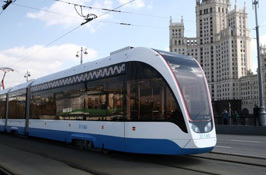 In the article of the newspaper " Vedomosti "called the new trams unmanned, but later in Mosgortrans explained RIA Novosti that the new intelligent system in the tram implies the presence of the driver, and its implementation will be"only a step towards the introduction of unmanned developments." These cars will be accompanied by drivers, and all their actions will be recorded by the Registrar. Data on the tests of the company, testing drones, will be transferred to the Institute NAMI, engaged in the development of unmanned vehicles. Experts of the Institute, in turn, will form requirements for unmanned vehicles, which will then be transferred to the Ministry of industry and interior. In 2014, Vladimir Putin instructed the government to develop a National technology initiative (NTI) - a plan to support promising sectors of the economy. One of the directions of NTI became unmanned vehicles. The government has already approved a plan to "improve legislation" in this area, which includes amendments to the 1968 Vienna Convention on road traffic. The Forum and the Exhibition will take place at Expocentre Fairgrounds, Moscow, located a the address: 14 Krasnopresnenskaya Naberezhnaya, Pavilion 8, on April 23-26, 2019.